ORCID--or Open Researcher and Contributor Identifiers--are unique IDs that you can use as a researcher to identify your academic work. 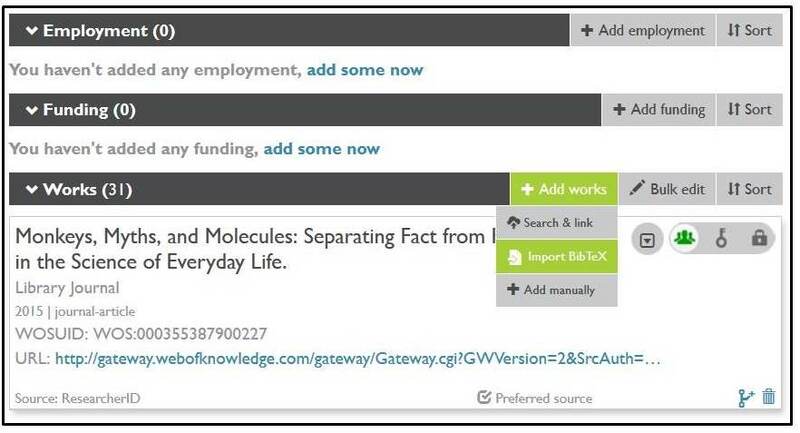 The IDs help funders, publishers, scholarly societies, and other researchers to quickly find and distinguish your work from materials created by other researchers with similar names. ORCIDs are being used increasingly by publishers ranging from the Royal Society to PLOS, the American Geophysical Union, IEEE, and Wiley. 1.) Get an ORCID for free at https://orcid.org/register. Use your WSU email to register. 2.) Add your scholarly works: Once you’ve created your ORCID ID, you can add works to your record, set up automatic updates, or delegate management of your account to someone else. 3.) Use your ORCID ID: Include your ORCID ID on your webpage, when you submit publications, on grant applications, and in other research workflows to ensure that you get credit for your work. There has been an explosion of ‘ORCID-fever’ in recent months throughout Middle Eastern university corridors. Lots of researchers are talking about this emerging identifier but not all are signing up. Here, I examine the top 5 reasons why scholars have decided to sign up, or not. Before we start, what is it? The Open Researcher & Contributor ID (ORCID) is a unique identifier for researchers. Each researcher gets one unique number that is then linked to their list of publications, contributions and funding grants. You can now send your ORCID number to anyone who you would like to review your activity such as potential employers, friends, colleagues, funding bodies. For any activities you prefer to keep secret, you simply click a padlock that keeps the content confidential but lets people know the article is there. An ORCID identifier is an improvement on your name because it is a number that cannot be confused for another and therefore instantly solves the problem of finding lists of research articles published by people with similar names or using variations on their own name. Once you have an ORCID identifier and start using it in your research workflows, your research output will benefit from improved discoverability. ORCID is indexed by Google Scholar, and you can also link it to the author systems used in key databases like Web of Science and Scopus. By attaching your unique identity to articles, datasets, patents, etc., you ensure that all of your work is found when other scholars search for your research output. Many major publishers and research funders are supporting the ORCID initiative. Representatives from the Wellcome Trust, Nature Publishing Group, Thomson Reuters, and others sit on the ORCID Board of Directors. Organizations can do many useful things with your ORCID iD, such as automatically fill in your personal details so that you do not have to complete their online forms manually. Publishers can also push the details of your new article directly to your ORCID account following publication. If you have linked your ORCID iD to your research profiles, this saves you the trouble of adding new publications yourself. As more organizations implement ORCID integrations such as those described above, you will waste less time on repeatedly entering the same data into different research information systems. ORCIDs have already been integrated into workflows used by a variety of publishers, funders, and research organizations. The result is that citations can be automatically pushed to and from your ORCID profile with minimal effort on your part. Your ORCID iD is issued to you personally, and is not connected with HKBU or any other institution that you have been affiliated with. Should you move to a new position, your ORCID iD goes with you, ensuring that you always have a unique way to identify yourself as an author or contributor. Use your WSU email when you register, and set your privacy preferences using the options listed. Note that "public" is the default option for your profile, while "limited" allows you to exchange information with select organizations. If you already have an ORCID ID, you don't need another one as this ID will be yours uniquely throughout your career as a researcher. However, you may want to connect your ID to WSU systems. Why? Once connected, you can log into your ORCID account using your WSU network credentials. You can also push citations/achievements from your ORCID profile to WSU activity reporting or grant application systems, saving yourself time in the long run. To connect your ID, navigate to https://orcid.org/signin and click on the "Institutional account" tab. Once you select WSU as your home institution and sign in with your ORCID credentials, your ORCID will be linked to WSU. After registering for your ORCID, you can add personal information, educational background, grant awards, and works to your profile. Adding these things will increase the usefulness of your profile for others who wish to determine what work you have done in the past. Get started with edits by signing in to your account. Note: For an overview on how to edit your profile page, see this post by Rebecca Bryant. Under "Works," you can add your publications, performances, reviews, and other academic works in one of three ways. First, you can import citations from databases. To import citations from any of these databases, choose one and you will launch a search on your name as author. A wizard will prompt you to select your citations and associate them with your ORCID profile. For both Web of Science and Scopus, you will ultimately be assigned a ResearcherID and Scopus AuthorID (if you do not already have one) and these identifiers will be associated with your ORCID. Note that while you are importing citations, you can choose to have databases automatically update your profile, adding citations whenever you publish. Find out more on the ORCID blog about automatic updates provided by Scopus, CrossRef, and Web of Science. If you have already created a Google Scholar profile, you can populate your ORCID profile using the citations listed there. 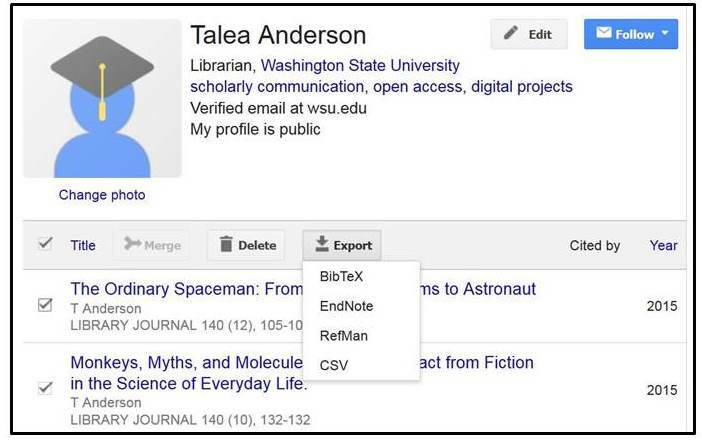 Navigate to your Google Scholar profile and select the citations you'd like to add to ORCID. Click on "Export" and select "BibTeX." 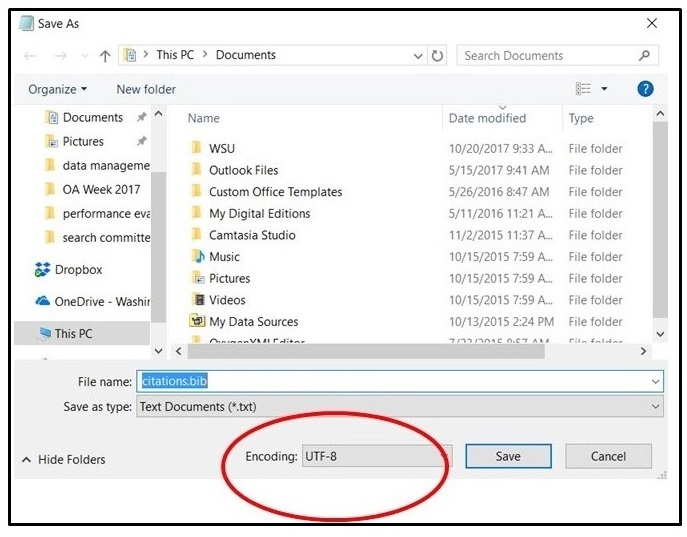 Copy your citations into a text editor and save the file as a .bib file with UTF-8 encoding. Next navigate to your ORCID profile. Under "Add Works," select "Import BibTeX." Select your .bib file and complete the import. If you cannot find your citations in Web of Science, Scopus, CrossRef, Google Scholar or another database, you can enter them manually. Under either "Funding" or "Works" in your ORCID profile, navigate to "Add manually." ORCID provides some 37 work typesthat you can choose from when listing citations. These include categories like artistic performance, data set, invention, lecture, and license. 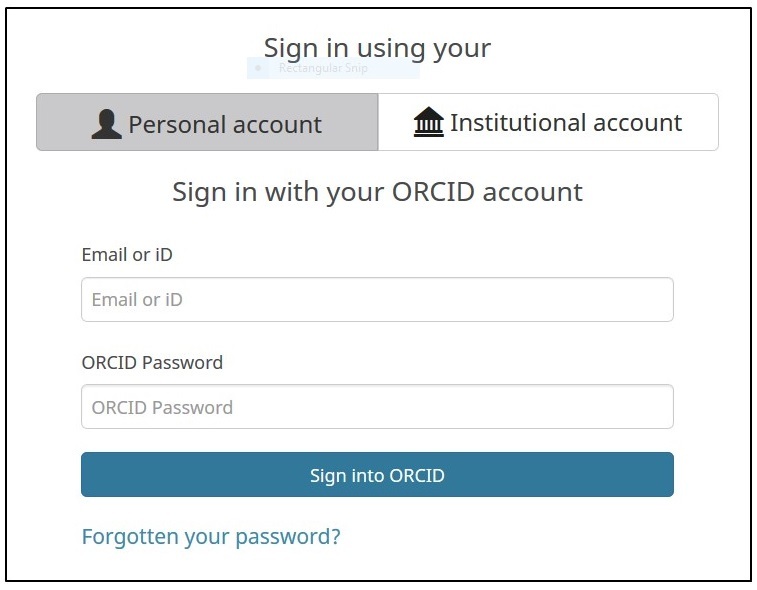 Sign into your ORCID profile using your WSU login: On the ORCID sign-in page, select "Institutional account." This way you don't have to remember your ORCID login. Make your works public: This maximizes the visibility of your research, and options for integrating your ORCID account with other systems. Add name variations to your ORCID profile: If you have published under other names, be sure this is reflected in your ORCID profile. Use your ORCID ID: Provide your ID as prompted when submitting manuscripts and grant proposals. Link your ORCID ID: Link your ORCID to other services including ResearcherID, figshare, and professional organizations. Consider displaying your ORCID ID: You may want to include your ORCID on posters, webpages, email signature lines, blogs, and social media accounts--anyplace where you'd like to refer others to the body of your research. More and more publishers and funders are asking for ORCID iDs during processes like manuscript submissions and grant applications. Be sure to provide your ORCID iD whenever the option is available. This will increase the visibility and the discoverability of your work. When HKBU creates your ORCID account, it will be populated with your research output that we have on file for you. One way to import your additional works into ORCID is by linking your account to other research systems. At present there is no way to directly connect your Google Scholar profile with your ORCID iD. However, it is possible to export your citations from Google Scholar and import them into your ORCID iD. This is particularly useful if you have painstakingly curated your Google Scholar profile for accuracy and completeness. The ORCID support site has a step-by-step guide on how to export your works from Google Scholar into ORCID by exporting your citations in BibTeX. Feel free to ask the Library to help you to do this. It is also worth noting that simply having an ORCID iD is probably helpful in keeping your Google Scholar profile accurate and up to date. The ORCID Registry is open to all, including Google's crawlers. While we do not know exactly how Google Scholar indexes content, it is certain that the information they crawl includes the ORCID Registry. If you have a ResearcherID, you can associate it with your ORCID iD. This allows for seamless data exchange between the two systems. Thomson Reuters, the company behind ResearcherID, has prepared a screencast explaining the integration of the two systems. You can watch it here. Please ask at the Library if you need any help with linking your ORCID iD and your ResearcherID. Most scholars will have at least some of their published works included in the Scopus database. Scopus automatically generates author profiles, but your works may be spread across multiple different profiles due to the problems of author disambiguation (which ORCID is here to solve!). Once you have an ORCID iD, be sure to let everyone know about it! Include it in your e-mail signature, your website, or in any other place where people might want to find out more about you and your research work. What are ORCIDs and ORCID, Inc.? 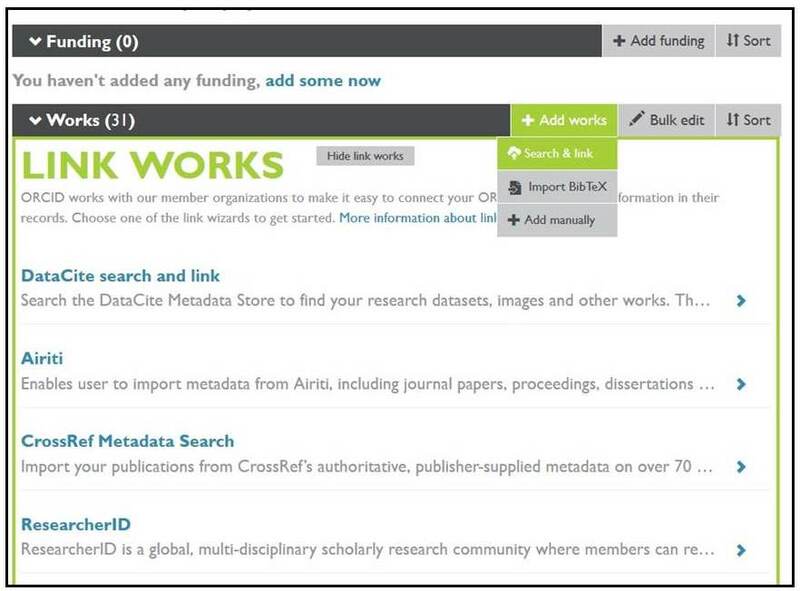 ORCIDs are Open Researcher and Contributor Identifiers. 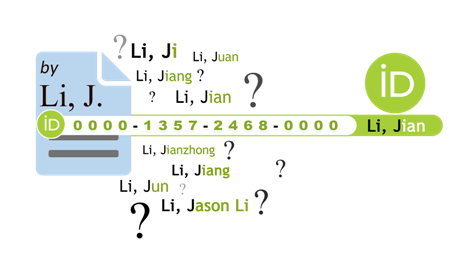 They are provided to researchers as unique identifiers to distinguish their research from that of others who may have similar names. ORCID, Inc., is an international, not-for-profit organization that manages the registry of researchers who have claimed ORCIDs. For more about the organization, see the ORCID FAQ page. If you do not already have an ORCID ID, you can claim one at https://orcid.org/register. Use your WSU email when you register, and set your privacy preferences using the options listed. Note that "public" is the default option for your profile, while "limited" allows you to exchange information with select organizations. How can I add citations to my ORCID profile? Please see these instructions for adding citations to your ORCID profile. ORCID is being used by hundreds of research institutions, funders, and publishers. In 2016, eight publishers announced their plan to require ORCIDs as part of the publication submission process. These publishers included: Science, Public Library of Science (PLoS), IEEE, eLife, EMBO and Hindawi. Nature Publishing Group, Elsevier, and Wiley also have accepted ORCIDs since 2012 and may move toward requiring them as the system matures. Should I have both a “personal” and “institutional” ORCID ID? No, you should have only one ORCID identifier. If you previously signed up for an ORCID ID at the request of a publisher or other institution, we’d encourage you to link that ID to WSU systems. The advantage of this institution linkage is that you can import citations from your ORCID account into WSU systems like the annual activity reporting system and save yourself time on re-entering information. 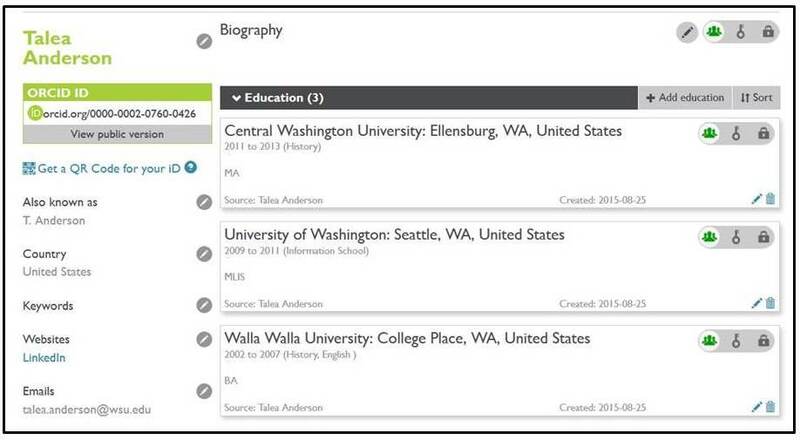 If you already have an ORCID ID, find out how to link an existing ORCID ID to WSU. If you have two IDs, find out how to remove an unwanted ORCID ID. How do I use my ORCID ID? Sign into your ORCID profile using your WSU login: On the ORCID sign-in page, select ‘Institutional account” and Washington State University. By logging into ORCID using your WSU credentials, you won't have to look up your ORCID login. How can I link My NCBI, SciENcv, and ORCID? In case you do not know about SciENcv, it is a CV tool that allows you to maintain grant applications, biosketch information, and progress reports associated with grants. SciENcv was being developed by the NIH along with the DOD, DOE, EPA, NSF, USDA, and the Smithsonian. See more about SciENcv on this background information page. You can set up SciENcv by logging into (or creating) your My NCBI account. Next navigate to the My NCBI home page and click on the box marked SciENcv. You can then create your SciENcv profile either by using your eRA Commons account or by manually entering information. As you work on setup, look for the link to add your ORCID ID to your SciENcv profile. I have an ORCID ID but would like to allow someone else to edit it. How do I do that? Log into your ORCID account and select "Account settings" at the top of the page. Scroll down to the "Trusted individuals" section. Here you can designate another person who can then edit your account. What do I do if I have multiple ORCID IDs? If you have more than one ORCID ID, you'll want to remove your extra account(s). 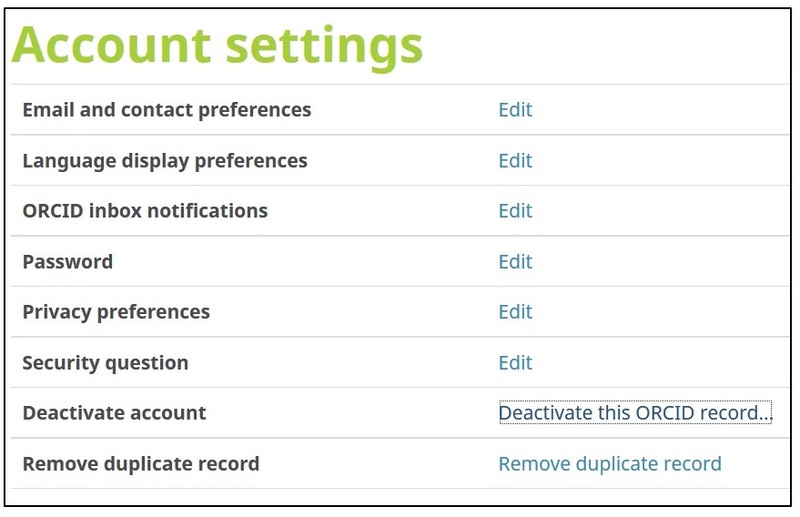 Sign into the ORCID account that you'd like to keep and navigate to "Account settings" at the top of the page. Scroll down to "Remove duplicate record" and enter the login information for the account that you'd like to remove.